TERROIR have responded to an invitation from Akira Suzuki, Toyo Ito, Riken Yamamoto, Kengo Kuma and Kazuyo Sejima to provide an inspirational image for a "home for all" affectedd by the Japanese earthquakes earlier this year. "The massive March 11 earthquake-tsunami wrought unprecedented damage to northeastern Japan. Over 100,000 people lost their homes and were forced to take shelter in relief centers and temporary housing. The relief centers offer no privacy, scarcely enough room to stretch out and sleep, while the hastily tacked up temporary housing units are little more than rows of empty shells—grim living conditions either way. Yet even under such harsh conditions people try to smile and make do, using empty boxes for dining tables, staging amateur concerts in cramped quarters. They gather to share and communicate even in extreme circumstances, a moving vision of community at its most basic. Likewise, do we not see here the very origins of architecture: the bare minimum shaping of places in which to commune. Is not an architect someone who can make such places for meager meals and shows a little more human, a little more beautiful, a little more comfortable?" 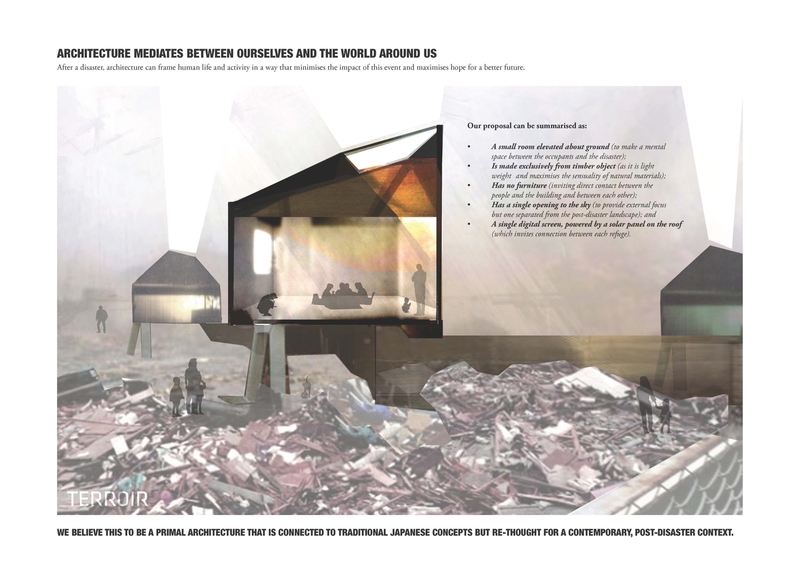 Our image is based in the idea that architecture mediates between ourselves and the world around us. After a disaster, architecture can frame human life and activity in a way that minimises the impact of this event and maximises hope for a better future. The image will be exhibited with others at the Sendai Mediatheque and Toyo Ito Architecure Museum in Imabari in July, 2011.